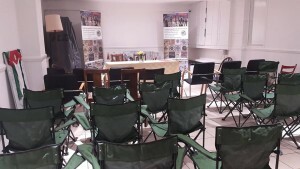 This was the main room for the CADFA conference (the events room at Cafe Palestina) on Saturday 14th July before the conference started. Once it started, we had a very energetic and positive conference and would like to thank everyone who spoken and everyone who came. Here is the conference report (with some pictures taken on a very full day). Posted on July 19, 2018 by CADFA.